Nell chooses not to talk, or simply can’t talk about her past trauma with her loved ones. What are the repercussions of this silence on Pearl, Diana and Lucy? In what ways are the women affected differently by Nell’s silence? How is the notion of ‘silence’ commented upon more broadly in Heart of the Grass Tree? Does the distance of Kangaroo Island from the mainland play into the storytelling at all? When Nell and Diana, express themselves artistically, things are set in motion that are both painful and restorative. What is the role of art in the healing process for these women, and generally? Once the sealing camp has broken up, William and Maringani are relatively free to live how they want to. Why do you think they choose to remain on the island? Do you think the novel makes a comment on the effect of forcibly removing children? Are there any echoes between the forced removal of Nell’s child, and the forced removal of Indigenous children under government policy? What do you think the symbolism of the grass tree might represent? 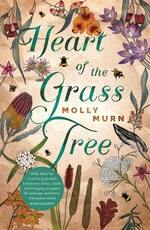 Heart of the Grass Tree is told across the centuries from different perspectives. How effective is this as a story-telling technique? Did you resonate with one timeframe more than another? Motherhood, in its myriad manifestations, is central to the novel, would you agree?